There's a lot to celebrate this holiday weekend at the Aquarium's New Balance Foundation Marine Mammal Center. 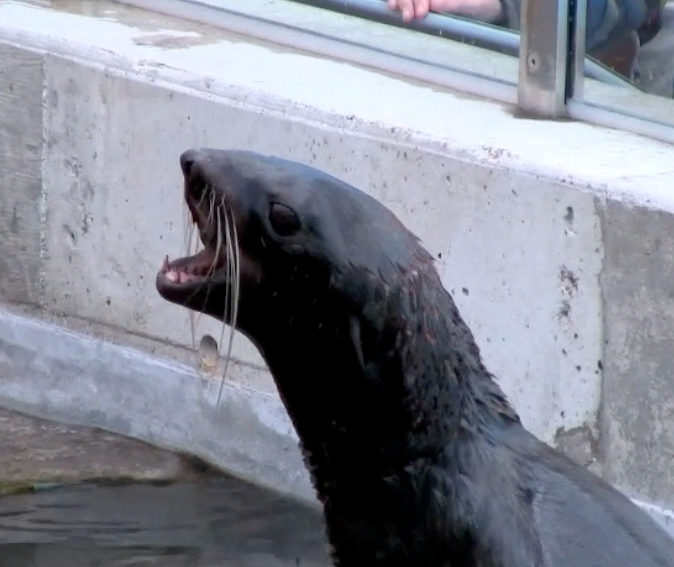 Many of you learned on this earlier post that two new fur seals debuted on Friday! The gang showed Roxie and Taz a very warm welcome all around. Take a look! As you can see, Ursula greeted her mom right away with the customary nose-to-nose hello. Baranov, Isaac and JD joined in with some swim-by greetings. And of course, Cordova, the noisiest of our fur seals, shouted her welcome. Wow! Welcome to the new seals Taz and Roxie!!! Lovely! Welcome to the new seals! What does hidden fish in an ice pile spell? FUN!